Traditional Linux operating system distributions come packed with everything – applications, toys, media apps, games, utlities, etc. If you are a student or part of an educational institution you may looking for something more tuned to getting things done in this space than entertainment. 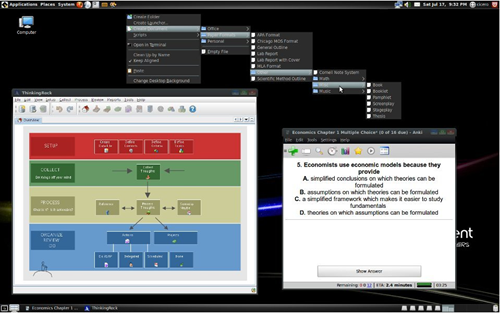 UberStudent is an Ubuntu-like Linux distribution geared especually for students, learners, researchers and knowledge workers. 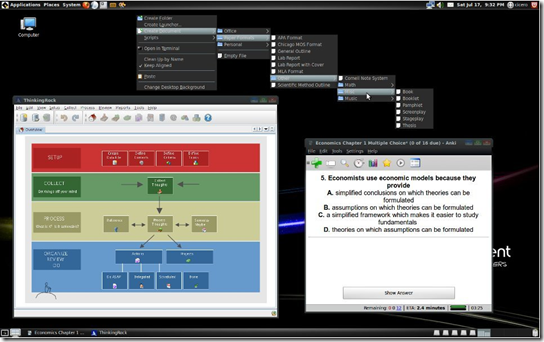 UberStudent (uber meaning "productive" in Latin) is a free, user-friendly Linux distribution for learning, doing, and teaching academic success at the higher education and advanced secondary levels. It is supported by a free Moodle-based virtual learning environment. At core, UberStudent is Ubuntu installation complete with student-friendly tools and customizations to help you get your school work done efficiently. For example, even the Firefox browser is customized to offer note taking integration, screen capture, bookmarks to textbooks, research. If you have been looking for an education-friendly linux distribution, give UberStudent a try. If you are an educational institution, UberStudent is backed with professional support.